Sunday 31C. 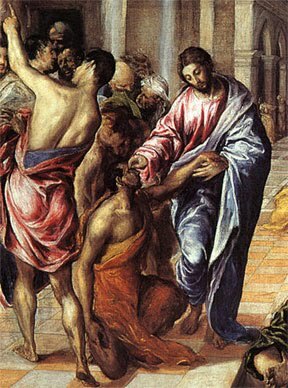 On Reparation: "I shall give to the poor"
Zaccheus is filled with remorse for his sins, so much so that he promises publicly, before Jesus and other witnesses, to perform reparations for his crimes. What moves Zaccheus to this sincere contrition for his sins and the vow to change his life, even to a willingness to endanger his livelihood? How does he find within himself such superhuman generosity? He has encountered the transforming supernatural power of Divine Love. Conversion has a social component because it is a rejection of sin and its social consequences. Sorrow for sins, always necessary for receiving the grace of God's forgiveness, should always accompany one's works of reparation for sin. Sorrow for sin is always required when celebrating the sacrament of Confession in order that the penitent may indeed receive the graces of the sacrament. As well, one's sorrow and experience of God's healing love can and should move one to repair damage or replace what is taken away from others by one's sins. Reparation, as seen in the example of Zaccheus, may under certain circumstances be a duty for the penitent. The Sacrament of Penance and Reconciliation reconciles the repentant sinner both with God and with the communio, or community, of the Church. 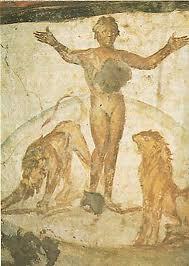 Zaccheus was converted from an attraction to evil by his attraction to the love of Christ and a desire to share in it. Saturday 30C: "When shall I go and behold the face of God?" I went with the throng and led them in procession to the house of God. Amid loud cries of joy and thanksgiving, with the multitude keeping festival. This mystery of blessed communion with God and all who are in Christ is beyond all understanding and description. Scripture speaks of it in images: life, light, peace, wedding feast, wine of the kingdom, the Father's house, the heavenly Jerusalem, paradise: "no eye has seen, nor ear heard, nor the heart of man conceived, what God has prepared for those who love him." Bl. 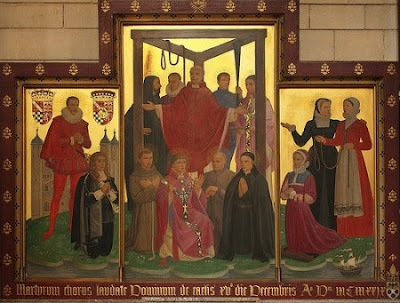 Martyrs of Douai: "the one who began a good work in you"
It is right that I should think this way about all of you, because I hold you in my heart, you who are all partners with me in grace, both in my imprisonment and in the defense and confirmation of the Gospel. 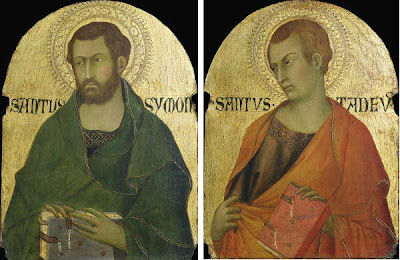 Ss Simon and Jude: "You are no longer strangers"
In Vigilia Ss. Simonis et Judae Apostolorum / Vigil of Ss Simon and Jude: "Fathers"
S. Evaristi Papae et Martyri / S Evaristus: "Be subordinate to one another"
Ss. Chrysanthi et Dariae Martyres / S Chrysanthe and Darius: "live in love"
... as Christ loved us and handed himself over for us as a sacrificial offering to God for a fragrant aroma. To the offering of Christ are united not only the members still here on earth, but also those already in the glory of heaven. In communion with and commemorating the Blessed Virgin Mary and all the saints, the Church offers the Eucharistic sacrifice. In the Eucharist the Church is as it were at the foot of the cross with Mary, united with the offering and intercession of Christ. 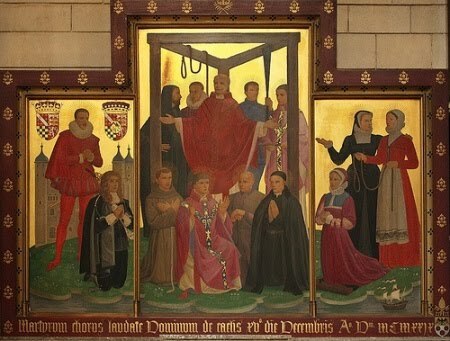 San Juan Capistrano / S John of Capistrano: “"Why do you not judge for yourselves what is right?" S Celine: "I kneel before the Father"
St. Luke in his gospel often expresses wonder and praise at the marvels of Christ and in his Acts of the Apostles stresses them as actions of the Holy Spirit: the community of Jerusalem, the invalid healed by Peter and John, the crowd that gives glory to God for that, and the pagans of Pisidia who "were glad and glorified the word of God." Sunday 29C: "Moses kept his hands raised up"
For bodily weariness there is rest and upon arising from sleep one is able to rejoin the human race with renewed vigor. One may even go apart from work and home for an extended period. But in the task of prayer there can be no rest, for Christ commands us "Pray always". Prayer is the vigilance of one in battle, defending the stronghold of the soul against temptation and sin. In the Book of Exodus Israel we read that Israel is under attack. Moses, his hands aloft, is the figure of intercession and prayer on behalf of the people in the life and death struggle against Amalek. Only as long as he is able to hold his hands thus will the chosen people gain the victory over their enemies. That he may continue to pray and not grow weary he is seated upon a stone and his hands are supported with the help of Aaron and Hur. Aided thus he is steadfast and the chosen people are victorious. Moses’ prayer in the battle against Amalek is a sign only of the greatest warrior and the most awful struggle. Jesus Christ upon His cross holds his hands aloft with the help of the nails; His feet are supported not by a stone but by a piercing nail. His hands are held in place in the perfect prayer for the sake of victory over the most terrible enemy of death which entered the world through sin. Until the last drop of His blood is shed and until His last breath His hands are held thus. There is no rest; the battle is total. All must be given to defeat the enemy of all. The holy Mass is the experience here and now of this most glorious battle of God over the most fearsome enemy of death. But in order that His victory may be in us and that we may find life unending in Him we must pray always this prayer of victory. We must not lose the heart of sacrifice so that our sins may not tear us from His grasp. A superficial or trite celebration of the holy rites can mislead and deceive the faithful, lulling us into a lax and casual understanding. The liturgy can become a mere social gathering, an opportunity for friends to say hello or a venue for trotting forth the latest fashions. The crowding of the faithful into the sanctuary, making of it a mere stage, have undermined the truths of the Mass, displacing Christ as the actor who saves sinful man. The role of altar server is for many just another activity for the boys and girls to include on their list of social services in anticipation of applying for high school rather than an opportunity to encourage young men to associate with the work of the priest as an opening to a priestly vocation. These things most assuredly have nothing in common with the death of Christ on the cross, relived in each Mass and undermine what is most necessary in the life of the praying Church. We have not been serious as a Church about what we say we believe about the Eucharistic Sacrifice. And we have paid the price. Attendance has fallen as uncatechised Catholics on the margins replace the Mass with sleep, shopping or other more satisfying social events. Young men have dropped out of service on the altar as young women, at such an age much more poised and socially at ease, have taken over their roles. Vestments, sacred vessels, and sanctuaries lack noble beauty. Lectors who have not practiced the reading of the Scriptures prior to Mass leave the people without a proper hearing of the Word. 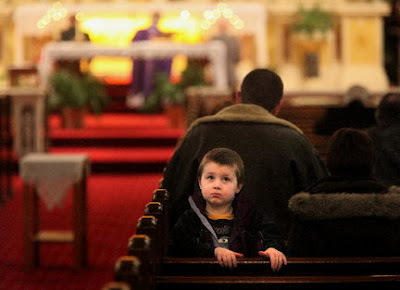 Priests replace prayer with banter and prescribed liturgical gestures are ignored. The family is the unique school of prayer where the most lasting lessons are learned. Family prayer leads to and flows from the perfect prayer of the Church which is every holy Mass. At every moment, all over the world, the Body of Christ is at prayer. In churches, chapels, convents and monasteries, with soldiers in the field of battle or with the persecuted in hidden places, the hands of the faithful are raised aloft in union with the heart of the suffering and triumphant Lord. Our liturgy of the Mass is the upraising of the Lord’s hands on the Cross unto death, that He may then rise to give us life. We must never grow weary of a correct and dignified offering of the sacred rites. The Lord God has proved we are worth it with the payment of the most precious cost: His own Life Divine. Meeting Christ in the Liturgy (See also Catechism of the Catholic Church paragraph number 695.) Publish with permission. S Hedwig: "I do not cease giving thanks for you"
Prayer is both a gift of grace and a determined response on our part. It always presupposes effort. The great figures of prayer of the Old Covenant before Christ, as well as the Mother of God, the saints, and he himself, all teach us this: prayer is a battle. Against whom? Against ourselves and against the wiles of the tempter who does all he can to turn man away from prayer, away from union with God. We pray as we live, because we live as we pray. If we do not want to act habitually according to the Spirit of Christ, neither can we pray habitually in his name. The "spiritual battle" of the Christian's new life is inseparable from the battle of prayer. S Edward the Confessor: "Blessed the man who follows not the counsel of the wicked"
The duty of obedience requires all to give due honor to authority and to treat those who are charged to exercise it with respect, and, insofar as it is deserved, with gratitude and good-will. Pope St. Clement of Rome provides the Church's most ancient prayer for political authorities: "Grant to them, Lord, health, peace, concord, and stability, so that they may exercise without offense the sovereignty that you have given them. Master, heavenly King of the ages, you give glory, honor, and power over the things of earth to the sons of men. Direct, Lord, their counsel, following what is pleasing and acceptable in your sight, so that by exercising with devotion and in peace and gentleness the power that you have given to them, they may find favor with you." S Wilfrid: "for freedom Christ set us free"
Sunday 28C: "give glory to God"
Jesus cures ten, but only one returns to give thanks. "Were not all ten made clean? The other nine, where are they? No one, it seems, has come back to give glory to God but this foreigner." Perhaps this percentage of thankfulness continues among God's children today. All have abundant and infinite reason to give thanks yet very few turn to the Lord with words and hearts expressive of gratitude. The teaching of Christ here is not about the healing of the flesh; it is of a far greater and more precious gift: the grace of God by faith in Christ Jesus. God's gift of faith in the Son of Man is poured out freely for all, regardless of race, language, or place. The working of his grace is seen here in the gratitude of the Samaritan. He who was thought to be socially repulsive, and an outcast even before he contracted leprosy, shows the dignity of faith in returning to give thanks to Christ. "Rise, and go your way, your faith has saved you." How often do our prayers turn to the theme of thanksgiving to God? Does our concern for present needs and wants cloud our remembrance of past gifts and blessings? Do we forget that all we have and are is "gift" - what then should be our response to the Giver? Giving thanks is at the heart, and gives its name to, the most important act of the Church: the offering of the holy Eucharist in the sacrifice of the Mass. The Scriptures are our model of prayer and illustrate for us the many reasons and occasions on which we can and should render thanks to God "from whom all blessings flow." Refusal to thank another may imply one deserves the gift. Entitlement is an illusion to which all humans can fall prey. This dishonors the generosity and virtue of the giver and shows sinful pride in the receiver. Failure to thank God makes the creature equal to the Creator. Reality is distorted and pride reaches even greater heights: the finite pretends to infinity. Pride is to be shunned by the baptized believer as a sin against divine love which puts salvation at risk if unrepented. "- indifference neglects or refuses to reflect on divine charity; it fails to consider its prevenient goodness and denies its power. "- ingratitude fails or refuses to acknowledge divine charity and to return him love for love. "- lukewarmness is hesitation or negligence in responding to divine love; it can imply refusal to give oneself over to the prompting of charity. "- acedia or spiritual sloth goes so far as to refuse the joy that comes from God and to be repelled by divine goodness. Thankfulness is a necessary component and expression of our love for God who has loved us in Christ to His death on the Cross. What can we do but give thanks every day to God who has put to death our death by the death of His own Son and, by the outpouring of the Holy Spirit, given us a share in His own life which never ends? If we open our hearts and minds to this perspective of faith, how could we fail to begin and end every prayer and offering in heartfelt and loving thanks to our heavenly Father? Friday, 27C: "those who have faith are blessed"
For all who depend on works of the law are under a curse; for it is written, "Cursed be everyone who does not persevere in doing all the things written in the book of the law." "... do not be ashamed of your testimony to our Lord"
"Participation in the communal celebration of the Sunday Eucharist is a testimony of belonging and of being faithful to Christ and to his Church. The faithful give witness by this to their communion in faith and charity. Together they testify to God's holiness and their hope of salvation. They strengthen one another under the guidance of the Holy Spirit." " 'Sunday . . . is to be observed as the foremost holy day of obligation in the universal Church' (CIC, can. 1246 § 1). 'On Sundays and other holy days of obligation the faithful are bound to participate in the Mass' (CIC, can. 1247)." "The first precept ('You shall attend Mass on Sundays and holy days of obligation and rest from servile labor') requires the faithful to sanctify the day commemorating the Resurrection of the Lord as well as the principal liturgical feasts honoring the Mysteries of the Lord, the Blessed Virgin Mary, and the saints; in the first place, by participating in the Eucharistic celebration, in which the Christian community is gathered, and by resting from those works and activities which could impede such a sanctification of these days. "The second precept ('You shall confess your sins at least once a year') ensures preparation for the Eucharist by the reception of the sacrament of reconciliation, which continues Baptism's work of conversion and forgiveness. "The third precept ('You shall receive the sacrament of the Eucharist at least during the Easter season') guarantees as a minimum the reception of the Lord's Body and Blood in connection with the Paschal feasts, the origin and center of the Christian liturgy." " 'We are unprofitable servants; we have done what we were obliged to do.' "
"Since we know neither the day nor the hour, we should follow the advice of the Lord and watch constantly so that, when the single course of our earthly life is completed, we may merit to enter with him into the marriage feast and be numbered among the blessed, and not, like the wicked and slothful servants, be ordered to depart into the eternal fire, into the outer darkness where 'men will weep and gnash their teeth.' "
"Faith in God's love encompasses the call and the obligation to respond with sincere love to divine charity. The first commandment enjoins us to love God above everything and all creatures for him and because of him." 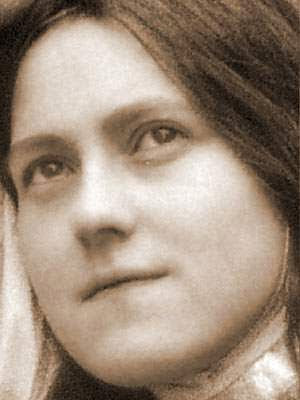 Saint Thérèse of the Child Jesus, virgin and doctor of the Church: “The harvest is abundant"
... but the laborers are few; so ask the master of the harvest to send out laborers for his harvest. The origin and purpose of mission. The Lord's missionary mandate is ultimately grounded in the eternal love of the Most Holy Trinity: "The Church on earth is by her nature missionary since, according to the plan of the Father, she has as her origin the mission of the Son and the Holy Spirit." The ultimate purpose of mission is none other than to make men share in the communion between the Father and the Son in their Spirit of love.